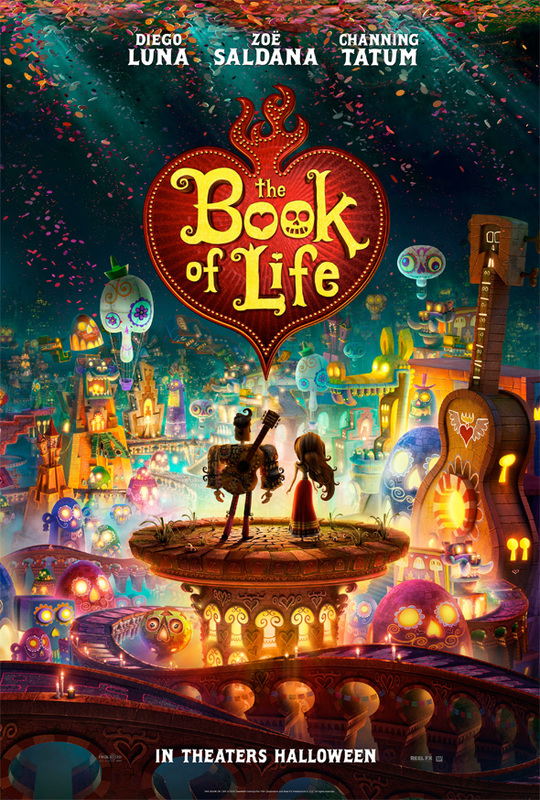 Following yesterday's first look photos, the first official trailer and poster for the animated film The Book of Life from producer Guillermo del Toro have arrived. The story follows the journey of Manolo (Diego Luna), an aspiring musician struggling with pleasing his family and winning over the love of his life (Zoe Saldana). There's some truly stunning animation on display here, like a mix of the world of Tim Burton's Nightmare Before Christmas, but in the style of the Day of the Dead celebration. Channing Tatum seems a bit out of place as a rival romancer, but this still looks like an original adventure for everyone. Watch it! The art for this looks incredible, but I can't say the same about the animation. Also the shot compositions look really weak. Nice looking, but story looks incredibly lame. Ermagerd! It looks so wonderful~~! Boy I hope that trailer music is no where near the movie. Agreed. The music in this trailer is bad! Reminded me of Grim Fandango.